Beautiful Bayfront Home w / Private Pier & águas profundas para excursões de caiaque, passeios de barco, pesca e caverna! Além disso, curta caminhada para o oceano ... Descontos disponíveis! A casa é projetada para aproveitar a vida na praia! Nível dividido com 1ª Suite Master Floor & New Full Bath, bela Bay Front, sala de estar w / tv, mini frig, controles deslizantes para o pátio frente à água e chuveiro ao ar livre com água corrente quente e fria. Lavanderia também é no 1 º andar. 2 º andar inclui cozinha completa w / 2018 aparelhos: máquina de lavar louça, gama, microondas, geladeira / freezer. Sala de jantar com controles deslizantes para o alpendre com vista para a baía; Sala de estar w / grande janela de baía e TV de tela plana e sofá-cama com sofá-cama foldout. 2º andar também tem Master Suite com casa de banho completa; Quarto Queen, quarto infantil com beliches incluindo 1 cama de casal e 2 camas individuais. Banheiro completo no corredor. Todos os quartos incluem uma TV e armário grande. É fácil embarcar, andar de bicicleta ou dirigir-se para desfrutar das calçadas, restaurantes, lojas e emoção de todos os Ocean City, Rehobeth Beach ou Bethany Beach e, em seguida, procurar um refúgio na tranquila e residencial cidade de South Bethany. Se você é novo na área, South Bethany Beach está localizado a 5 milhas a norte de Ocean City, Maryland, 10 milhas ao sul da Praia de Rehoboth, Delaware e 1 milha a sul de Bethany Beach, Delaware. Delaware oferece compras isentas de impostos. Esta propriedade está localizada @ o último sinal de trânsito em South Bethany em direção ao sul para Ocean City; Na Kimberly Road; Bayfront; Atrás do Centro Comercial York Beach, onde estão localizados o Café Gourmet McCabe, a Pizza Grotto, o Sushi Local e as Lojas Hookem & Cookem Bait & Tackle. A uma curta distância, aproveite as belas praias protegidas de Delaware ou as praias do Seashore Nacional que permitem a pesca e as permissões para veículos. 3 banheiros completos. Todos são espaçosos e modernos. 1 chuveiro ao ar livre com água quente e fria mais vestiário. Mesa de piquenique e grelhador de carvão no pátio. Alpendre selecionado tem mesa de jantar e mesa de café 4 cadeiras de praia incluídas Acesso de água a OC & Dewey diretamente da casa ... apenas um caiaque ou passeio de barco. Because hurricane Florence was lingering off the coast of North Carolina, the weather interfered with a couple of beach days. No worries, there is plenty to do when the weather didn’t cooperate. One day we visited the Delaware outlets and found fantastic end of summer deals with no sales tax!! We also visited the Nassau winery enjoyed some tastings and purchased wine for the up coming holidays. Rehoboth beach has some wonderful specialty shops and quaint restaurants. In the local papers we found plenty of happy hour specials offered and some had live entertainment. Smitty McGees is a favorite spot to watch the start of the football season offering drink and food specials. This house comes equipped with two kayaks and we enjoyed maneuvering around the canals after enjoying the beach. Also included in this House were 2 bicycles. The flat terrain provided a great opportunity to ride to Bethany’s Main Street where you can visits some local restaurants and specialty shops. This is one of our favorite beach destinations on the East coast and this house was truly a great find! We loved this house and the location was amazing. My 14-year-old is finally old enough to go out and about with a friend or cousin rather than a parent, so having bikes there was perfect! He and his friend were on the bikes and off to the beach (bike lock included, bring helmets) 20 minutes after we arrived and never once rode in the car to or from the beach the entire 2 weeks. Instead of computers and smartphones, he and his friend and cousins went out on the bikes before and after dinner every day. They kayaked too! It was the perfect place for an active teen. Parking on S. Ocean for the beach was easy every day! The outdoor shower, grill, great screened porch, garage access for entry and storage, comfy couches, were all loved and appreciated. Just a few improvements we'd recommend: There is not enough storage (for families that don't eat out a lot and do cook and need supplies, not having access to a pantry was a little tough but we made do), The main hall bathroom and each bedroom REALLY need hooks and towel racks - a few on the back of each door would be great - because there was really no place to hang and dry all the towels from each person there. The microwave is a bit small and the rotating mechanism (the track/wheels the glass dish sits on) kept getting wonky and we ended up removing it for the duration. We loved the suite downstairs!! The kids set up their Wii (that we brought with us) on the TV down there so they had a place to be crazy and noisy away from the main living space upstairs. One thing the grandparents noticed was there wasn't really enough clothing hanging space in the suite and a few hooks on the wall or door would be helpful. It was great to have a TV in every room and we brought our smart devices (Roku and Firestick) to be able to access streaming channels. Top bunk in the kids' room was squeaky! And would be so great to have two bunks so 4 kids could stay in there comfortably. But it was a really perfect space for my son and the other kids. Oh, Milk and Honey - a pizza/sub type place up at the corner, is a weird, weird place! But the pizza and the steak and cheese we got there were SO GOOD! The owner is eccentric, they sell stuff in there that looks like a thrift store, but the food was great. (We don't like Grotto.) If you're into sushi: CoCoLi Sushi on Garfield was great for eat-in or takeout. For takeout Chinese, we loved China Express up near Family Dollar. Thanks so much for a great stay, Donna!! We'll be back! Thank you so very much for your thoughtful review! I know that many folks shopping for their next vacation home, will greatly appreciate your insights. I truly value your suggestions, and I definitely will add more hooks & towel racks to the bathrooms & bedrooms. Thank you for choosing our home for your family vacation! Great house. Loved being on the canal. Easy Drive or walk to the Beach. Very close to McCabe's. The Kayaks were fun. Thank you so much for writing a review! We really appreciate the feedback. I am so pleased that your family had a good experience. Thank you for taking the time to write a review. We look forward to making additional upgrades over the winter months, and it would be our pleasure to host you again in the future. WOW!!!! This well appointed and tastefully decorated home,on a quiet cul-de-sac in South Bethany,gets better every year! 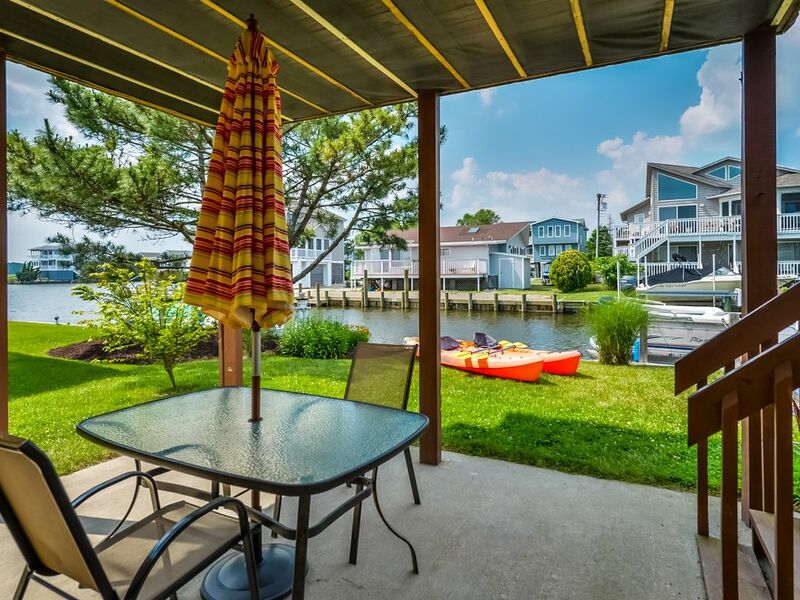 Complimentary chairs,bikes,kayaks, and parking passes are just a few of the extras this property provides for a fun-filled family vacation. The lower level suite complete with a water view, private bath,and sitting area was perfect for my parents who can no longer climb a flight of stairs.South Bethany offers beach yoga or a boot camp for the fitness enthusiast. The canals are perfect for kayaks and the flat terrain is perfect for a bike ride. No doubt , a stay here will keep you coming back!! Found the perfect home for our annual family vacation. It is spacious and has been updated nicely in many areas. We are avid bikers and loved that we could store our bikes safely in the garage. Loved having access to the dock and being able to kayak at our leisure. The neighborhood was quiet with very little traffic. The 10 minute walk to the beach was easy and I loved that we were so close to the dog friendly beach. The beach parking passes were also nice to have. We really enjoyed our stay and plan on returning. South Bethany Beach é uma área costeira entre a Ocean City, MD e Rehobeth Beach, DE. Fácil acesso, em frente à baía, a pé para o oceano. Perto lojas especializadas, Cidade de Betânia, Boardwalk, trilhas de bicicleta e muito mais! Observe no mapa que Logan St. É o mais próximo acesso ao oceano. À esquerda é uma bela praia salva-vidas e à direita, a National Seashore, permitindo a pesca e veículos de surf na praia. Outras atividades: caiaques e motos para 2! Economize $ em excursões ... w / sem taxa de aluguer! Doca o barco @ o cais privado. Fish & caranguejo do quintal. Caminhada 2 da praia de salva-vidas protegidas nadar no oceano. Caminhada 2 da praia para o surf pesca @ National Seashore. Downtown Bethany Beach & Boardwalk estão nas proximidades! Beautifully updated house, private garage, all the comforts of home. Great water access and serene water trails abound!